What Is The Game Of Polo? Players score by driving a small white plastic or wooden ball into the opposing team’s goal using a long-handled mallet. The traditional sport of polo is played on a grass field up to 300 by 160 yards (270 by 150 m). Now polo can be played on both grass fields and dirt. 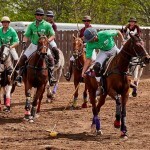 Each polo team consists of four riders and their mounts. game are unknown. It was first played by nomadic warriors over two thousand years ago but the first recorded tournament was in 600 B.C. (between the Turkomans and the Persians – the Turkomans were victorious). The name is supposed to have originated from the Tibetan “pholo” meaning “ball” or “ballgame”. It is since these origins in Persia that the game has often been associated with the rich and noble of society; the game was played by Kings, Princes and Queens in Persia. Polo has also been linked to the middle and upper classes in the more recent British past, especially with its origins in Britain being with the militia. Arena Polo does not require a large number of horses to play that Outdoor/Grass Polo demands. 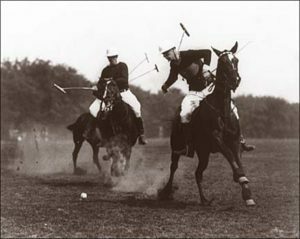 Many players use two horses, alternating horses each chukker/period. The Arena Polo ball is similar to a mini soccer ball, larger than the small hard plastic ball used outdoors. 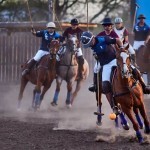 Unlike field polo, which is played on a 10-acre field, arena polo is played on 300 feet by 150 feet field, enclosed by walls of four or more feet in height. … Arena polo is also played year-round, which is attractive to many players because it makes progress in the sport easier and quicker. In the U.S., the USPA (United States Polo Association) Rules and Rules Interpretations govern all sanctioned events. 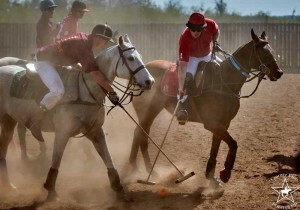 The rules of arena polo are very similar to those of outdoor field polo with the main differences accounting for the presence of the walls surrounding the playing field. 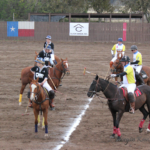 A regulation game consists of four chukkers/periods of seven and one-half minutes each. Riders change horses at the end of each chukker/period. 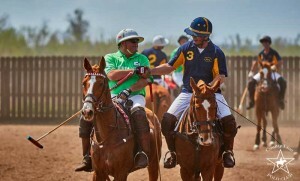 The basic rules of the game are similar to those in field polo, and are concerned with the safety of the horses and riders. The toss of a coin dictates the direction of play at the start. Ends are changed after each period. The Umpire start play in any period by throwing the ball underhand, along the ground, between the teams which shall be lined up in parallel lines at the center of the arena. The timer shall start the clock at the moment the ball leaves the Umpire’s hand. A player’s ability is measured by their Handicap. Minus 2 is a beginner to 10 Goal being the absolute best in the game. Arena handicaps are generally one goal higher than the grass handicaps. A bell will sound 30 seconds before the end of the chukker. When the Umpire blows the whistle and stops play the clock is stopped. When a goal is scored, the Umpire shall signal by raising his arm but play continues and the clock is not stopped. 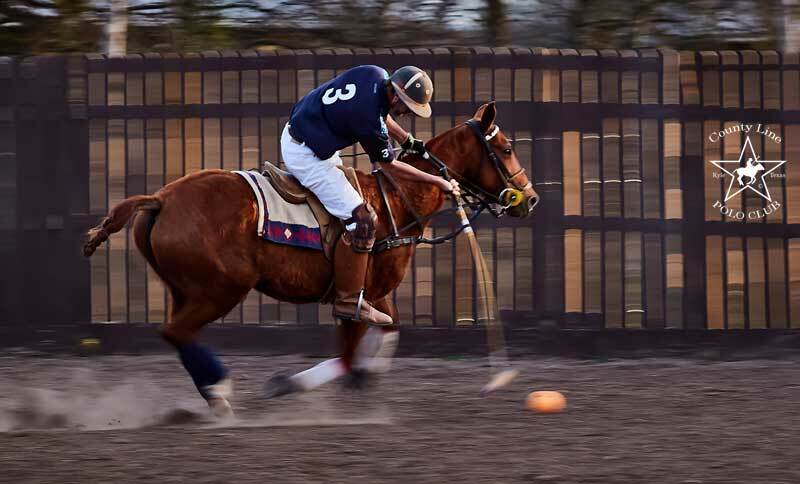 While they don’t go high speeds over long distances, horses need to utilize acceleration, strength, maneuverability and heart to play arena polo. 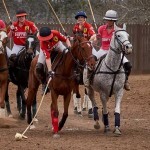 Just about any breed of horse can be used for polo, and mallet sizes allow players to use horses of differing height. 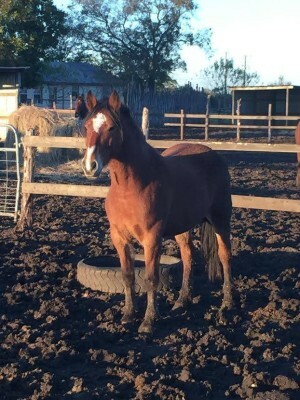 Horses usually take a year or two to train to become polo horses and can play into their twenties. Sometimes a fresh horse will be ridden in each chukker or two horses will be on rotation, but horses will not usually play more than two chukkers.